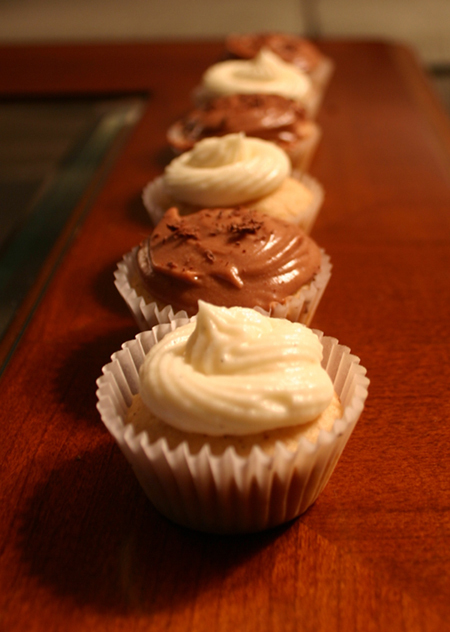 When regular cupcakes just aren’t small enough, it’s mini cupcakes! I made some spicy chili-chocolate mini cupcakes… and they were a disaster. 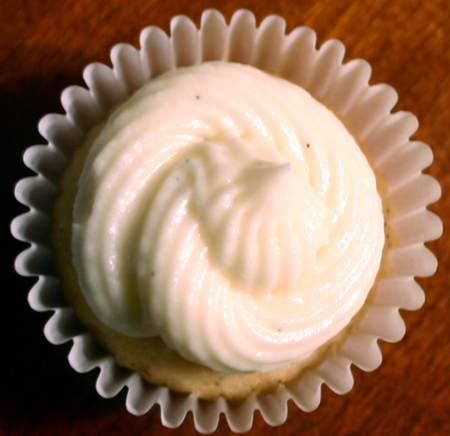 So then I made some vanilla bean cupcakes instead and they turned out great. I actually didn’t get too discouraged after the first incident, and the vanilla was a great idea. Beat the butter and sugar together, then add the eggs one at a time. Whisk together the dry ingredients in a separate bowl, combine the milk and vanilla. Alternately add in the dry ingredients and the milk. For the frosting I tried mascarpone cheese for the first time and fell completely in love with it. If you’re a poor student and can’t afford nice ingredients, buy some anyway. My small tub cost about $12, but I still have lots left, had a bit on a croissant this morning, mmm. Anyway, this is the best icing I’ve ever made and it’s my new favourite. My mom requested it for her birthday. I also already had chocolate icing, so I blended in some leftover strong coffee for a mocha icing and put that on a few cakes. Blend the butter and the cheese, scrape the vanilla bean seeds into the mix. Add the melted chocolate and mix thoroughly. 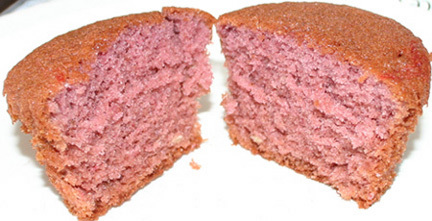 Mix in the icing sugar about 1 cup at a time, alternating with a bit of milk and a touch of vanilla extract. Try not to eat it all before you ice the cupcakes. 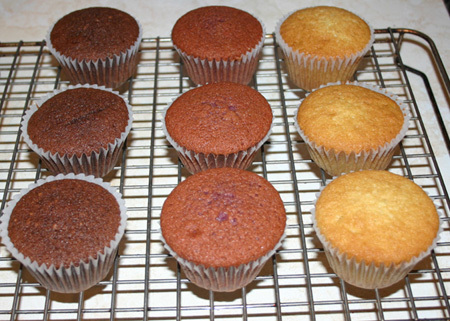 * for this recipe I used 1/2 a vanilla bean for the cakes and 1/4 of a bean for the icing. I used the remaining 1/4 bean to make a bit of vanilla sugar. It’s in a little mason jar with some granulated sugar to be used later. I’ve still got one Madagascar vanilla bean left, I’ll have to save it for something special. It’s Mexican because… um… salsa? 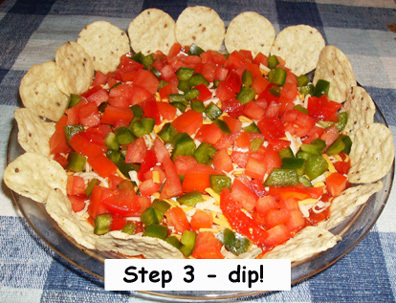 I remember my mom made this dip a lot to take to family gatherings, and I’ve tasted lots of versions of it over the years. I think most people have had something like it at least. Here’s my standard version. I used to scrape everything else off with a chip and just eat the cream cheese bottom, but all of it is really good. 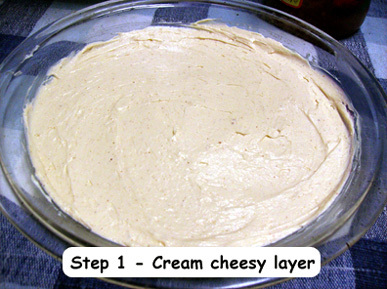 Blend together the softened cream cheese and miracle whip (electric beaters make this easy), add spices. (I don’t think I had onion last time but it’s good). Serve with tortilla chips. Really great for having at a party, or all by yourself watching movies. Mix everything together, then spread into a greased brownie-type pan (square or rectangular, not very deep). 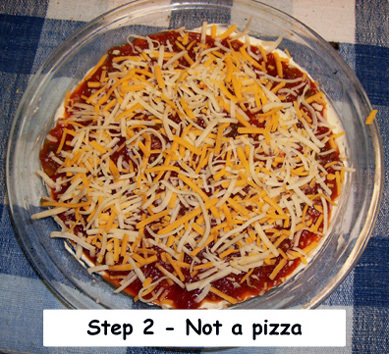 Bake at 350 F for about 25-30 minutes or until the edges are firm and turning darker brown. I served these warm out of the oven with a scoop of ice cream and a drizzle of chocolate sauce, but that’s absolutely not necessary, they’re amazing on their own. Make these for anyone who likes peanut butter and chocolate. 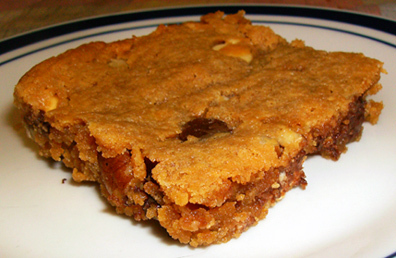 They’re a little crisp on top and perfectly fudge-y in the middle. Variations: For the chocoalte, I added some melted semi sweet chocolate and a bit more milk. For the strawberry, I stirred in strawberry jam. Very easy and it tasted amazing. The Strawberry was my favourite overall, but the chocolate – chocolate cupcakes might have been the crowd favourite. Study Snacks seemed to go well this week and all the cupcakes were eaten quickly and well-received. 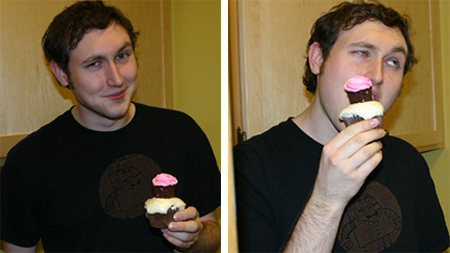 Here’s Liam eating one of my cupcakes with a mini cupcake on top. For this Sunday I made strawberry, chocolate, and vanilla cupcakes. 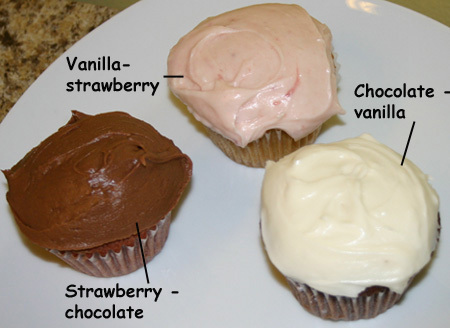 I also made strawberry, chocolate, and vanilla frosting, and gave some of each frosting to each type of cupcake. So there were nine different combinations. I made the cupcakes at home, brought them back to school and frosted them here. Cream the butter and sugar, add the eggs and vanilla and combine. Whisk or sift the flour, baking powder & soda, and salt in another bowl, then alternate adding the dry ingredients and the strawberry sauce into the butter mixture. 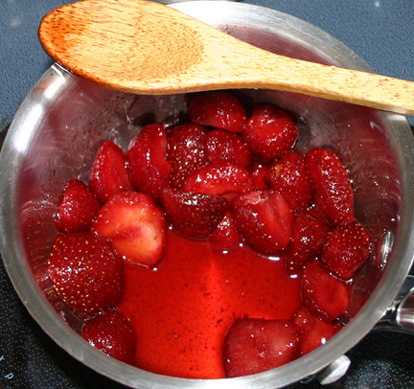 Let the strawberries sit with the sugar for about 5 minutes, then gently heat for about 15 minutes. Add the pepper (no, really. It’s amazing, use lots). Pour into a food processor or blender and puree. For the chocolate cupcakes, I added 2 tbsp of sifted cocoa, that’s all. Tah-dah! That’s chocolate, strawberry and vanilla (left to right). Coming up next: The icing! My mom got this new tea for Christmas from my brother. There are a few other kinds as well but Azteca Fire was the one I tried. 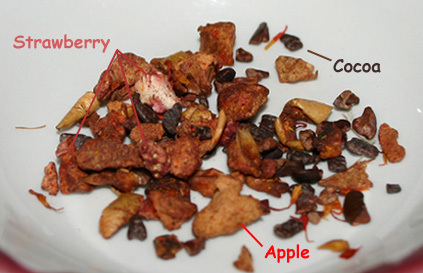 It smells amazing, it’s a herbal tea with strawberries, chilies, apple, cocoa and chocolate pieces. It’s really delicious, the flavour isn’t overly fruity or strong but really pleasant, and it has a touch of tingly heat in the back of your mouth after each sip. I added a bit of honey and it really brought out the sweet chocolate and fruit flavours. As for the cost, I got to try it for free but it is a bit pricey (the website’s below, you can see the cost per ounce). If herbal tea is really your thing, though, I would strongly reccommend it, it’s one of the nicest I’ve had. 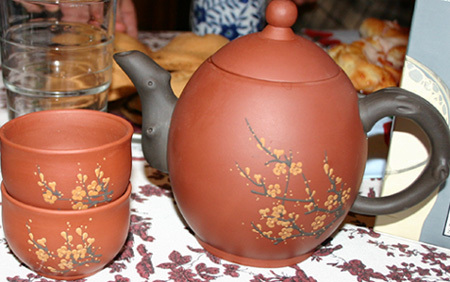 My brother ordered the tea (and this teapot and cups) online from Teavana. I went home over the weekend for the first time since Christmas. The first thing I did was make this salad.Then I made three dozen cupcakes and supper, but that’s for another post (or two). 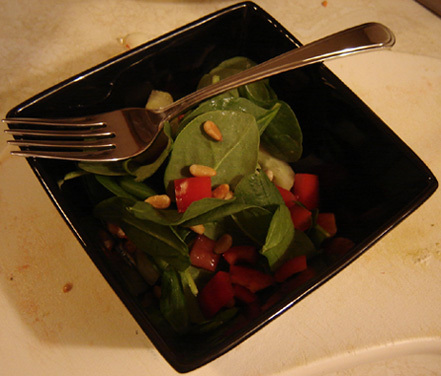 This was just a side salad for supper (we had pasta that my mom made), but I made it interesting by adding warm toasted pine nuts right before serving. Everyone loved it and there wasn’t any left, so I’d say it was a pretty successful salad. I toasted my pine nuts by putting them in a 350 F oven for just a minute or two until they were lightly browned.